Adukku Cake/ Layered Sponge Cake | Kitchen Samraj! Beat the egg n sugar together till the eggs are fluffy, mix in the flour, baking powder, vanilla essence, salt, milk. Heat the tawa, put 1/2tbsp ghee and spread it on all sides. Pour a laddle ful of batter and spread a little to form a pancake. Cook on low heat. when the edges turn golden colour, turn them over. Spread a l/2 laddle ful of batter on the top. Dot the edges with a little ghee. When the edges turn golden brown n the batter is cooked Turn them over, spread again 1/2 laddle ful of batter, repeat the process till the batter is over. Dot them well with ghee. Trim the edges Cut them into three parts and cook them on all sides. Remove n Slice them into squares. Wow wat a beautiful cake Nilou..have seen and had at one of my friend's place long back..soooo delicious..
Super Cake...Interesting way of preparing it..Thanks for the entry..
Ahh this is some interesting recipe. 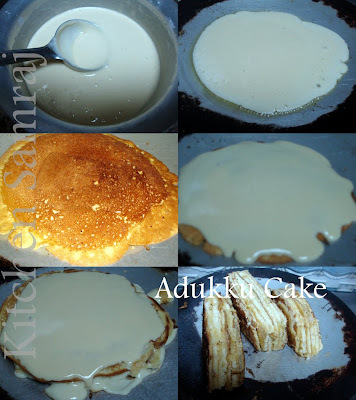 Love the adukku cake. It looks soo delectable. Def an unique and nice idea. Am totally drooling over ur layered cake....super yum they look!